cover and the hub pull out . no turning. 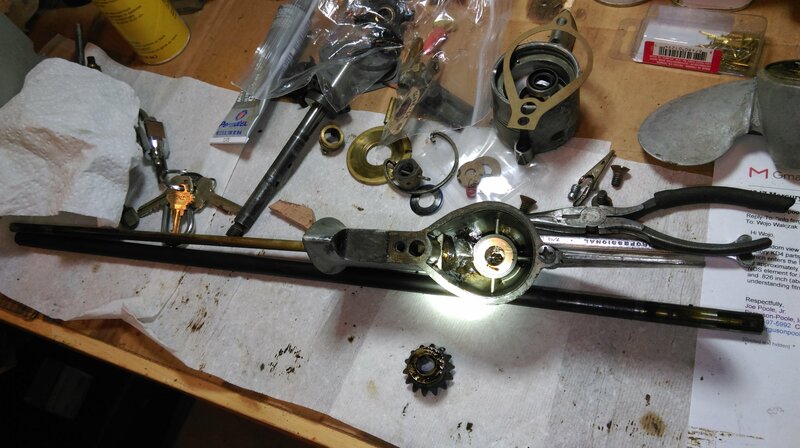 pull prop shaft and guts out as an assembly. 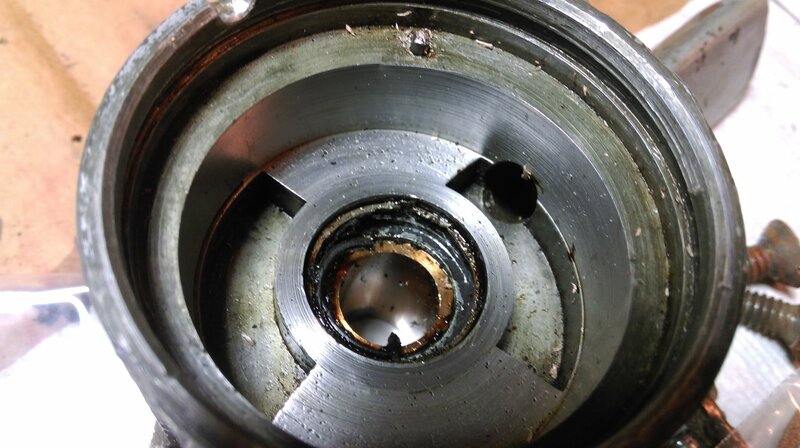 As Dave just posted, it's more likely that the "guts" go out the forward side of the propshaft/bearing carrier. So you're gonna have to pop loose the (2) screws (one above, one below) that hold the carrier assy to the gear housing. 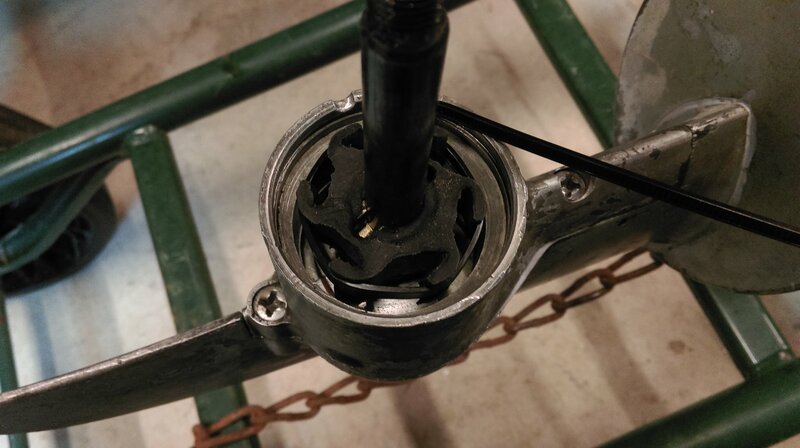 One of those screws (upper) is visible in the pic you just posted. 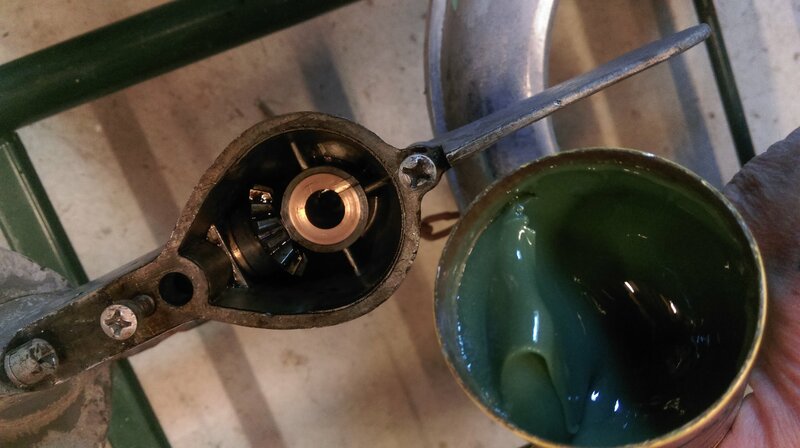 Then pull the guts out of the gearcase. 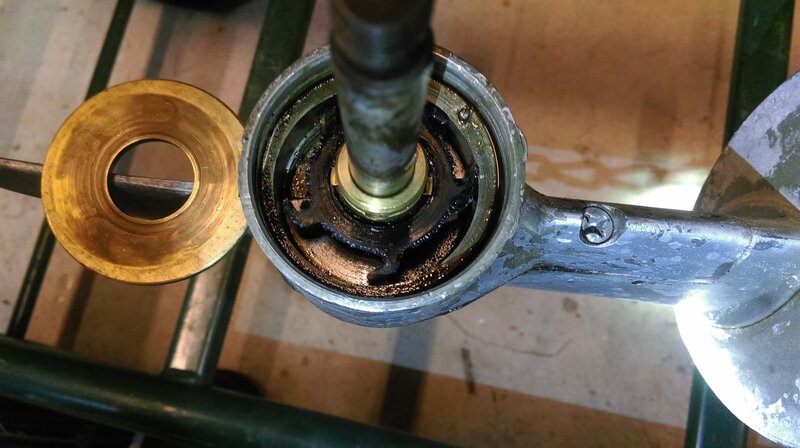 BTW regarding sealant for the tank joint, RTV is Not fuel-resistant enough for long-term sealing in direct contact with gasoline. Check out the testimonials on the Three Bond, it's some amazing stuff! Some good tips on application, as well. Heck, if you had a large piece of sandpaper and a big hunk of glass, you probably could lap-in the 2 halves of the tank and use the Three-Bond by itself. It's used for sealing motorcycle crankcase halves so it'd seal your tank just as well. But more likely you'll cut a couple of new gaskets, and this sealer should be excellent for that application as well. 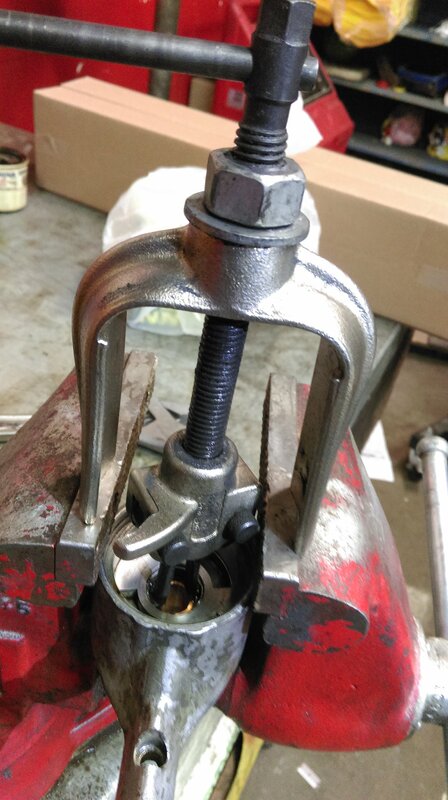 Even good ol' Indian Head Shellac Gasket Compound would probably do the job, it's been around forever and might have even been the sealer originally used! A bit messy, though, so use a small paint brush to spread the stuff on the flanges, and perhaps mask the external surfaces to protect them from the "slop", since it's pretty hard to clean off once cured. There ya go, even more things to think about! I've used more of this sealer than I could possibly count. It's rated as fuel-resistant and stays pliable. Good Stuff. IMHO, the Three Bond would be my 1st choice. too much choices Ed !!! 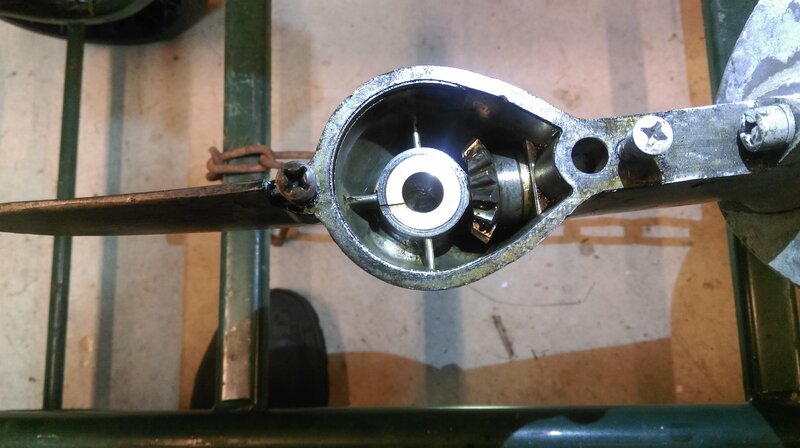 moved the plate back and forth few times then inserted a screwdriver in a hole in the hub of impeller drive........and off it went !!! 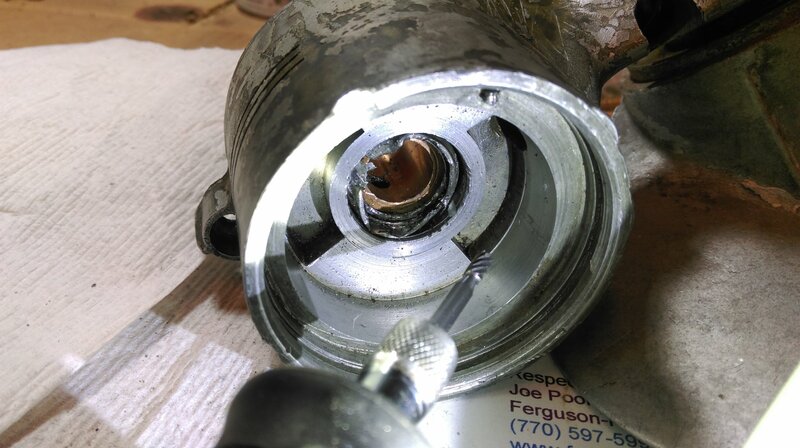 ....for sure I need new water impeller, the plate looks pretty good, a little wear but I don't think I need one - I am pretty sure I can turn it around to opposite side and use it. ....thinking of retireing and possibly moving to Omaha NE, not completely sure yet, but looking into houses for sale.........any member of this forum living in that area ?? Very Cool! You're making progress. Be sure to cut some teeny-weeny gaskets to go over every "post" where the screws hold the 2 halves of the tanks together. Otherwise it's gonna leak thru there. 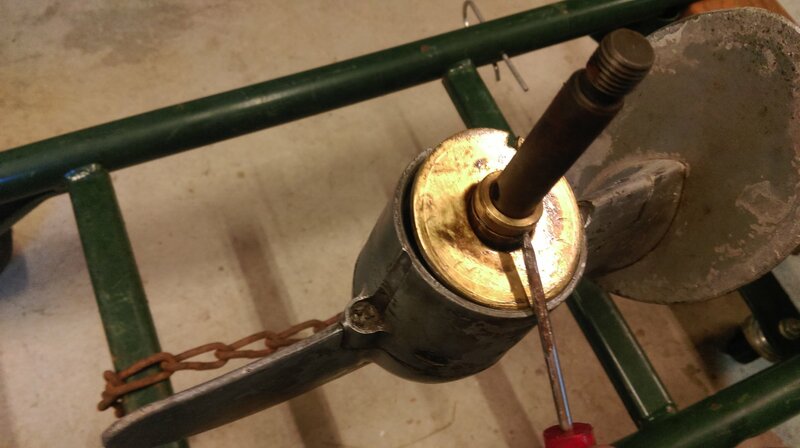 You could use the gasket glue to position the gaskets on one half of the tank, holding them in place while you carefully lower the other half. 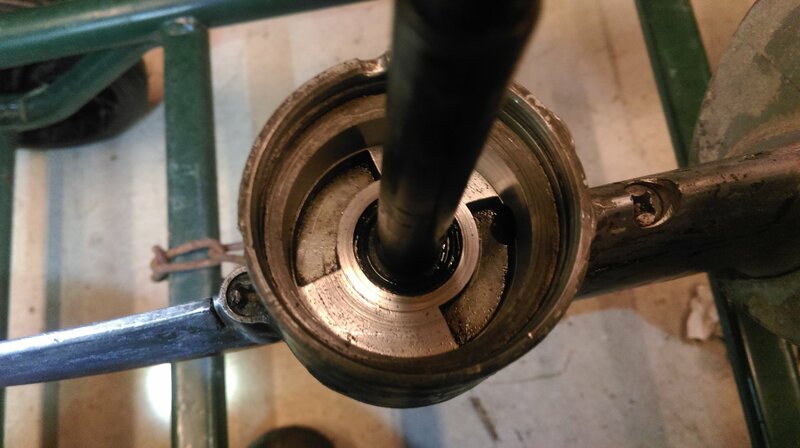 Put a thin coating of water-proof boat bearing grease or anti-seize on the screw threads before assembling. Ed, have gaskets at every post, no worries. 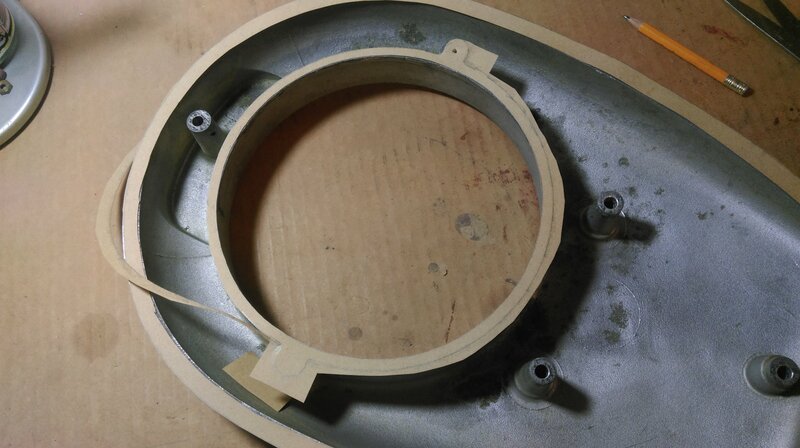 The gasket goop was very sticky, and was not easy to put the two halves together, but it's done! 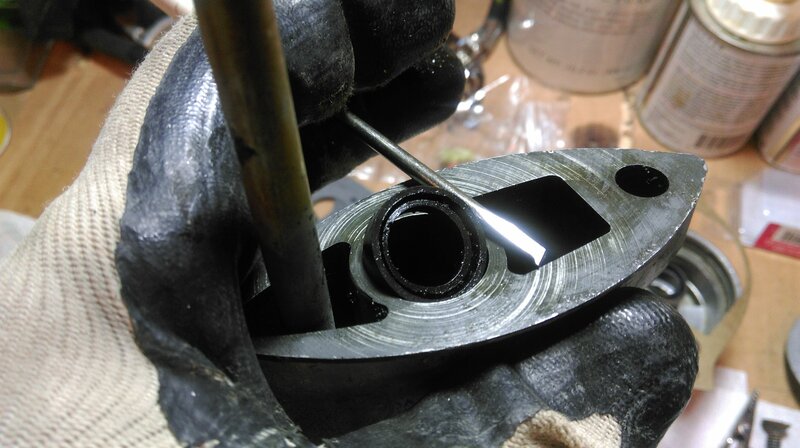 Since I put some Aerokroil oil into the water pump housing, I have decided to take it apart to cleaned it and replace shaft seals, to make sure that water is not getting there. 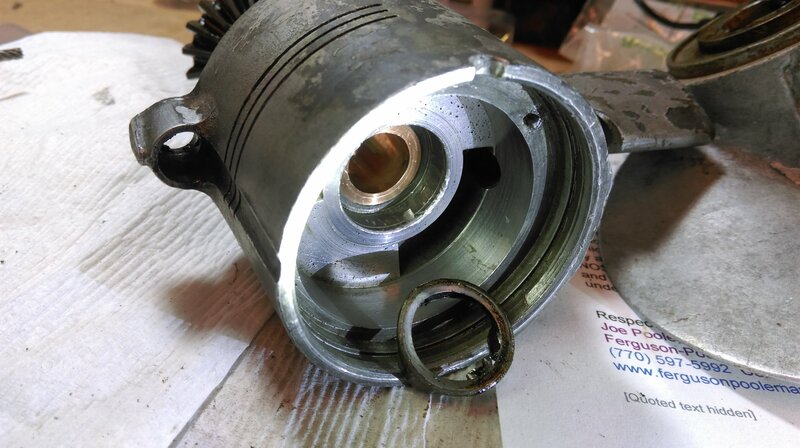 So far all bolts are easy to undo on this motor. That goop was the best thing to put in the lower unit. it was the original mercury grease. can't get it since the early 60's. use John Deer Corn Head grease NOT OIL. the best now for these motors. at any John Deer store or Ebay. best way to put it in is make a tool. 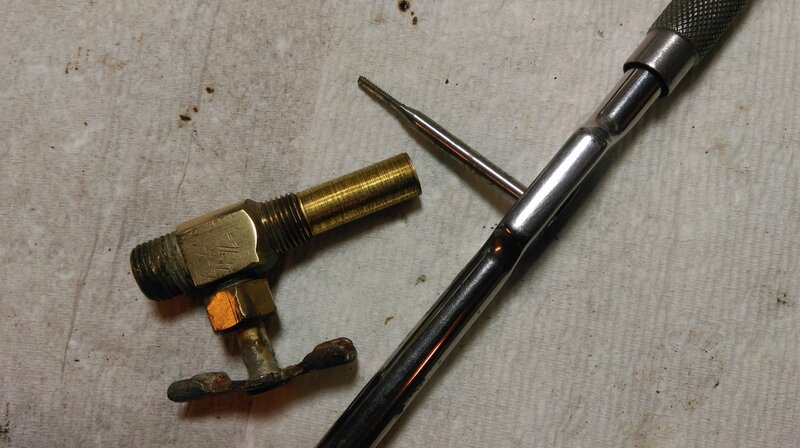 take a bolt that fits drill down the center add a grease fitting then use a grease gun. in the bottom out the small top. 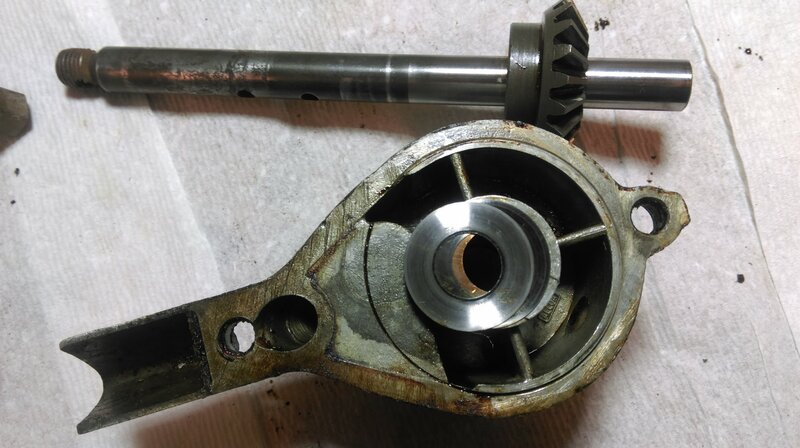 I have another dilemma here - got more parts, and one of them is an "shaft oil seal" that goes ( I think) above the gear - in the gearbox body....however I can not separate the bottom of the gearbox to install the seal......any ideas ? 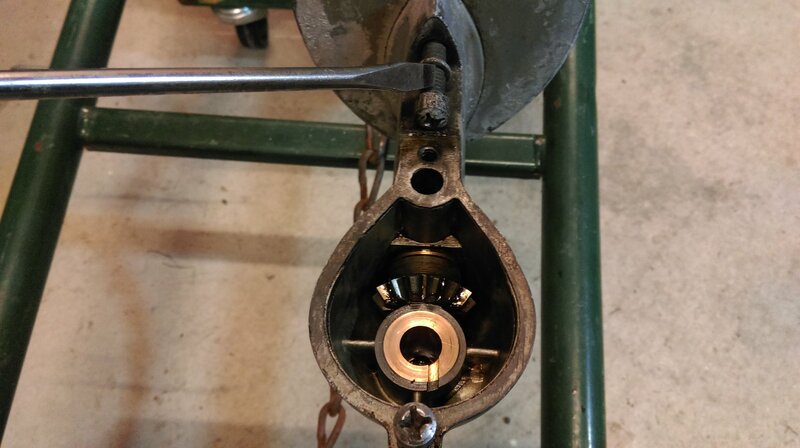 THAT SCEW AND THERE IS A NUT AT THE BOTTOM OF THE SWIVEL IT IS FOR A LONG STUD FOR THE LOWER UNIT. THE ONLY THING THAT MIGHT GIVE YOU TROUBLE IS THE WATER TUBE MAY BE FROZEN IN. IF IT WAS ME I WOULD LEAVE THINGS ALONE. THERE WAS NO WATER IN IT. JUST FILL WITH CORN HEAD GREASE AND CHECK EVERY NOW AND THEN. thank you guys, sounds like a plan ! 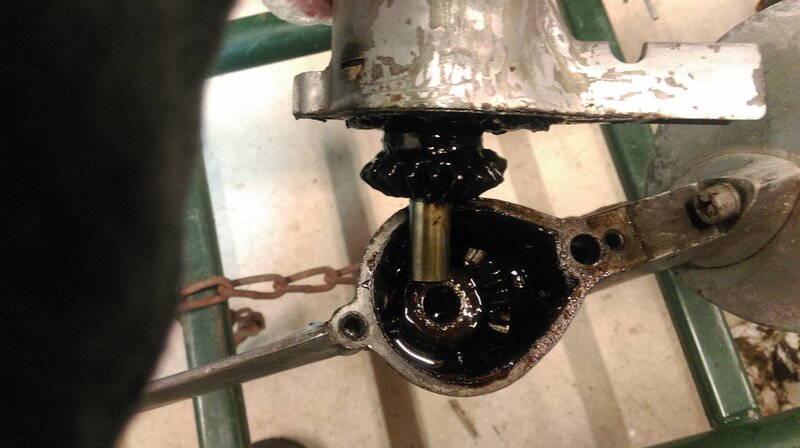 .....as it turned out it didn't go as planned - now the question is: how do I remove an old shaft seal?? ?......I thought that tis is just a rubber seal, but it does have a metal on the outside diameter - chipped out the rubber, what to do with the metal part?? from the back side use a small screwdriver and tap the shell out. dave bernard wrote: from the back side use a small screwdriver and tap the shell out. that would not work Dave - the brass part is over an inch long and nothing can reach the seals metal part. he told me to grind/cut the metal into two pieces and then pull it out......that did work...slight scarring - but not bad. Great job . I would put some sealer in for the outside of the seal. just in case. thank you Dave, that's what Joe from FergusonPool said too! 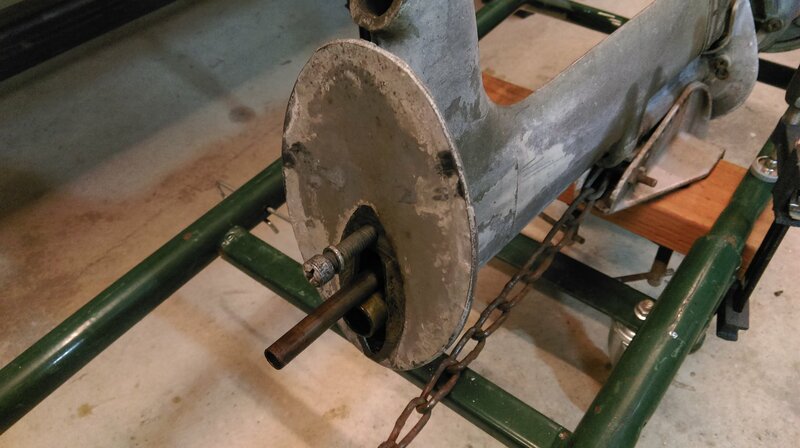 Today with Joe's phone/picture tutorial I was able to separate propeller gear case from the motor......everything came a part very easy....I think as a testimony for the motor that was used only in Idaho lakes. Have two more work days, but I should be assembling everything back early next week!!!! I couldn't sign in to the Fiberglassic in weeks........the bottom of the KD4 is done by now.....unfortunately I took too long and Dr.Frankenmerc is too busy to take on my project....so I need to continue on my own - with help from the forum.. The Rocket project was on hold for months now. 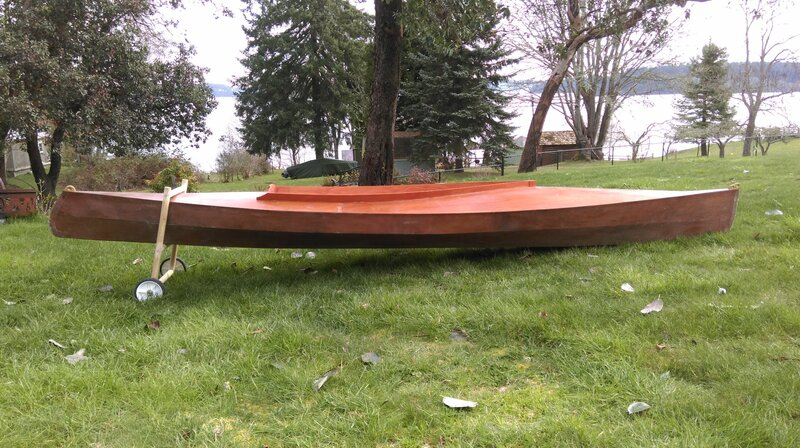 Just send an email to The Doc to see if he has the time to finish the project for me. Today I am taking my Glen L15 out for the first time this season - trailer without working lights and licence etc.